Christmas Wreath Hangers | Door Decorating Hardware | Free Shipping! Our No-Swing Christmas wreath hangers are the best wreath hangers you'll ever own! The unique design prevents your wreath from swinging back and forth, which can scratch and damage your door. No-swing Christmas wreath hangers are available in sets of 2 or sets of 3, with four different colors to choose from! Each Christmas wreath hanger features foam pads that adhere to the back of the hanger so it won't scratch your door or chip the paint. Home Products 'n' More is pleased to offer free shipping on all Christmas wreath hangers! Other unique products for holiday decorating include our Vinyl Siding Hooks. 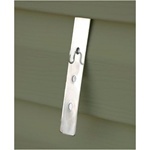 Did you know that our vinyl siding hooks are also one of the most popular items on our website? 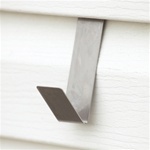 These special hooks are designed to clip under the edge of your home's vinyl siding so that you don't have to drill holes or put nails into the siding in order to hang something. Vinyl siding hooks can be used to hang address plaques, decorating items, planters... pretty much anything under the weight limit of 12 pounds. 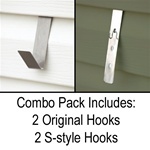 We offer vinyl siding hooks in two styles: the s-hook and original hook. If you're not sure which style will work best for you, we also offer a combination package that includes two of each style of hook. While you're here, please be sure to check out our holiday storage category. There you'll find a variety of products to store and protect your holiday decorations such as the artificial tree, garland and other greenery, wrapping paper and supplies, a holiday village, and much more. We are pleased to offer free shipping and handling on all seasonal storage products! If you have questions or need assistance ordering, please feel free to contact us.